Computer-aided design software can help you turn 2D and 3D designs into useful models and prototypes for a variety of fields. From floor plans and landscaping to kitchen remodels and 3D printing, CAD software has the tools to help you build and customize designs from the ground up. Whether you’re a hobbyist beginner, a professional engineer or an architecture student, you’ll want a CAD program tailored to your needs. CAD programs range from consumer-based packages, like the ones in our lineup, to professional applications, like AutoCAD. Consumer-based CAD software, while offering much of the same functionality as professional applications, doesn’t require the same steep learning curve and costly licensing. Mechanical CAD, design validation, product data management, design communication, and CAD productivity tools in a single package. Solidwork has user friendly interference . I have been using it in my company for sheet metal design. Solidworks allows you easy assembly and modelling feature.SolidWorks is robust and flexible, because of its parametric functionality, when any feature of the model can be modified, and the rest are rebuilt accordingly to the previous changes. SolidWorks is an ideal preprocessor for any Finite Element Analysis (FEA) and can be coupled with any FE-code, such as ABAQUS, ANSYS etc. The FEA add-in (SolidWorks Simulation) is also a good option, when an express structural analysis is needed. Product design software that addresses all manufacturing organizations, from OEMs through their supply chains, to small producers. CATIA V6 comes with full spectrum of tools for designing and analysis.While SolidWorks and ProE will do most everything you need, they don’t do as well when you want to work in a large collabrative environment. 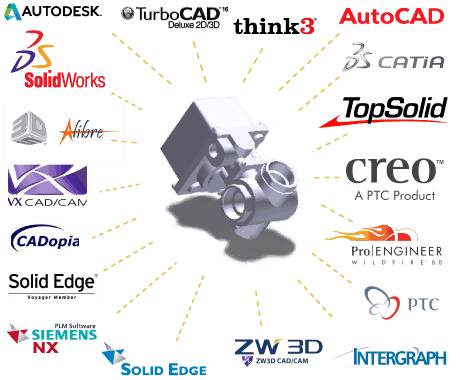 Catia is more versatile than SolidWork .Catia interface is little bit confusing and complex. Catia is preferred by lots of automobile industries. The usability of the software is very much engineering process based and applying features is very smooth and it gives the notifications every time you make something beyond the reality. The main reason i like this program is just because it seems it has its own brain that suggests you and prevents you to do as per the universal law. And that makes the design manufacturable. AutoCAD LT is very efficient within its capabilities. This 2D-only software enables the user to produce construction drawings without all the bells and whistles (and complications) of using 3D modeling softwares. AutoCAD LT maintains all the tools and features from regular AutoCAD that are relevant and essential for 2D drafting. Recent updates enable users to customize command-line searches and autocorrect options. AutoDesk 360 is also an option for communicating with files on-line with your coworkers or design teams. Inventor is very stable, and rarely crashes in a team/network environment. Inventor handles large assemblies (thousands of components) well. The insert assembly constraint (axis/face pair) is very useful for assemblies with holes, and more stable than a similar mate combination with Solidworks. Fastener mating is in some ways easier than Solidworks, and less likely to invert the assembly when it doesn’t work. I tend to lay things out and think things through a bit more before jumping in and modelling with Inventor. Very powerful industrial machine design modeling tool. Solid Edge features amazing technology that empowers the engineer to put concepts into a virtual assembly that is easily transmitted to field drawings, automatically generates bill of materials and is easily modified. It closes the gap between ideas and manufacturing. Tata Elxsi is a mechanical design company. it provides various jobs in the field of Automotive, aerospace and defense, enterprises to consumer electronis , entertainment to FMCG, Media to storage, semi-con to telecon. Tata Elesi industrial design division helps customers develop endearing brand and product by using design.